For designer divas - women who both covet and collect designer goodies for their quality, luxury, and luring appeal - there's now a cosmetic collection with haute couture quality at ready to wear prices. 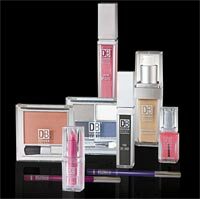 Designer Brands offers designer brand quality cosmetics for every woman. The Designer Brands research team has been on a quest for the past four years, researching the stand out cosmetic brands and products across the globe, with the brief to take the best elements of formulation and design and meld those superior elements into a new and exciting cosmetic collection, with a surprising twist - at a price that every woman can afford! Designer Brands offers superior formulations in a cosmetic collection that encompasses the most desired and popular products, housed in highly functional and extremely fashion-forward packaging. Whether you are woman who is a devotee of a particular cosmetic brand or one who is in search of the holy grail of cosmetics - makeup artist quality at an everyday woman's price - Designer Brands is sure to appeal. Designer Brands Cosmetic Collection debuts with Foundation (RRP $9.99); Concealer ($6.99); Lip Gloss (RRP. $5.99); Fruity Lips ($4.99) Lipstick ($5.99); Lip Liner ($4.99); Bronzing Powder ($7.99); Blusher ($6.99); Eye Shadow ($6.99); Eye Liner ($5.99); Mascara ($6.99); Nail Polish ($4.99).